I have been on a roll recently with some DIY Art. 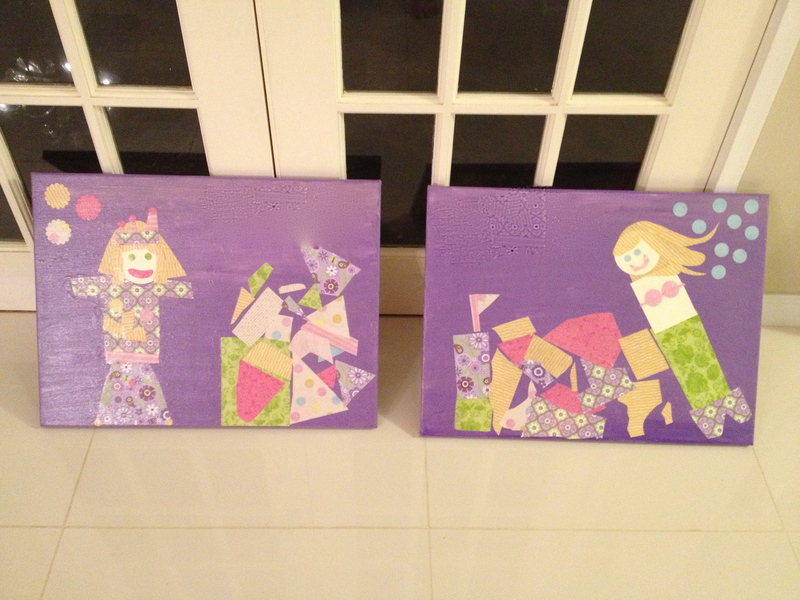 I’m in love with doing a multi-media canvas using paint and paper. I knew I could make some art just as nice but without the $250 price tag! 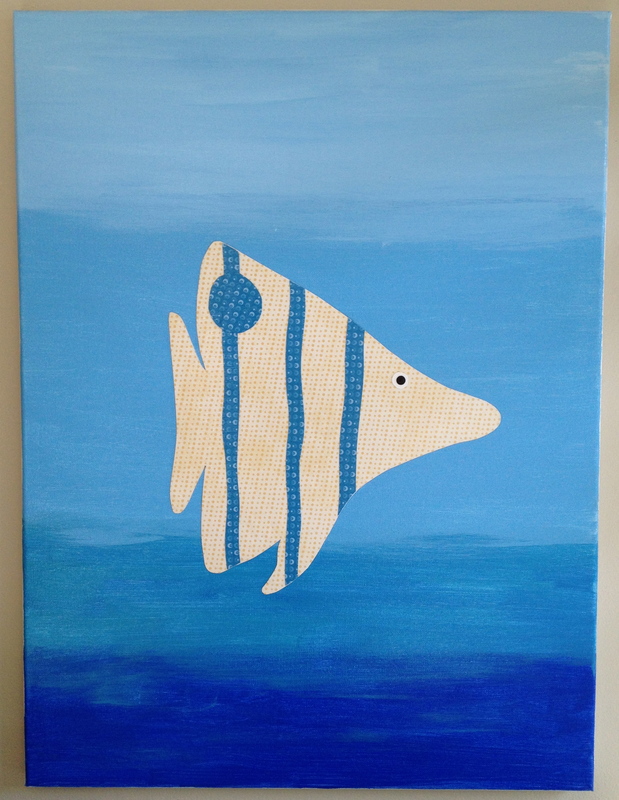 First step is to Paint your canvas background. I like to either squeeze it directly onto the canvas or use a paper plate to ease cleanup. You can also thin it with water. Next step is to cut out paper and lay it out in your design on the canvas. Once you have laid out all the pieces, you can start to paste them on to the canvas. 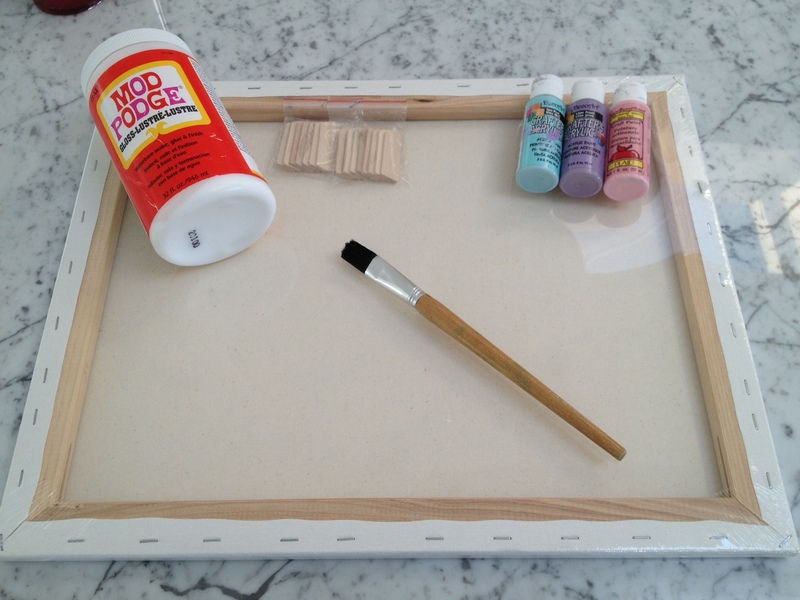 Apply a layer of Mod Podge directly onto the canvas. Put down your paper piece. Then go over the paper with more Mod Podge and smooth out any air bubbles. Also be sure to put Mod Podge between any layers of paper that overlap. USE a LOT of Mod Podge, but at the same time smooth it out really well. It starts out white but it dries clear. The kids even helped me with these purple ones. They completely designed and cut out the pieces all by themselves. If you help coordinate the colors, sometimes it doesn’t matter how they cut out the shapes, it all looks good together! To the right of the princess it’s supposed to be a Castle. 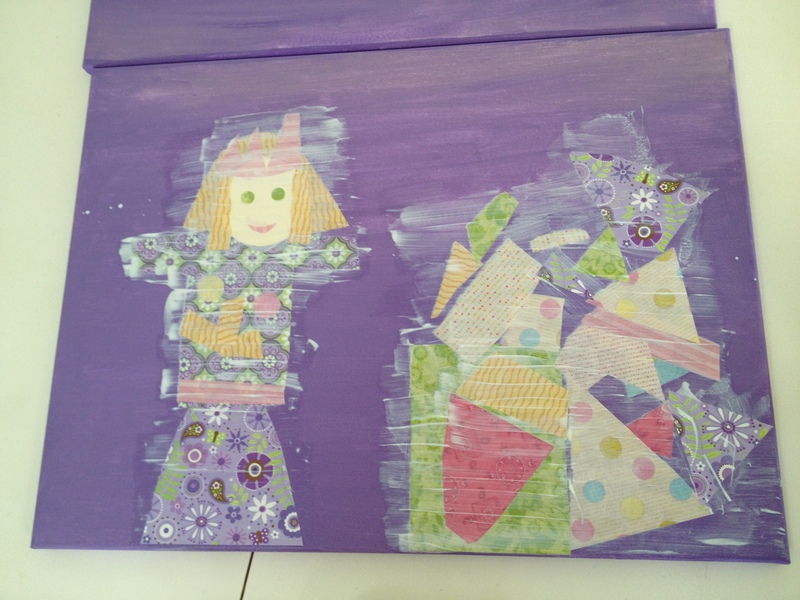 Once you are finished with all the pieces, go over the entire piece of art again with 2 coats of Mod Podge, letting it dry somewhat in between coats. It recommends spraying with Acrylic but I have not found that necessary. Mine have held up for a few years without any coating. 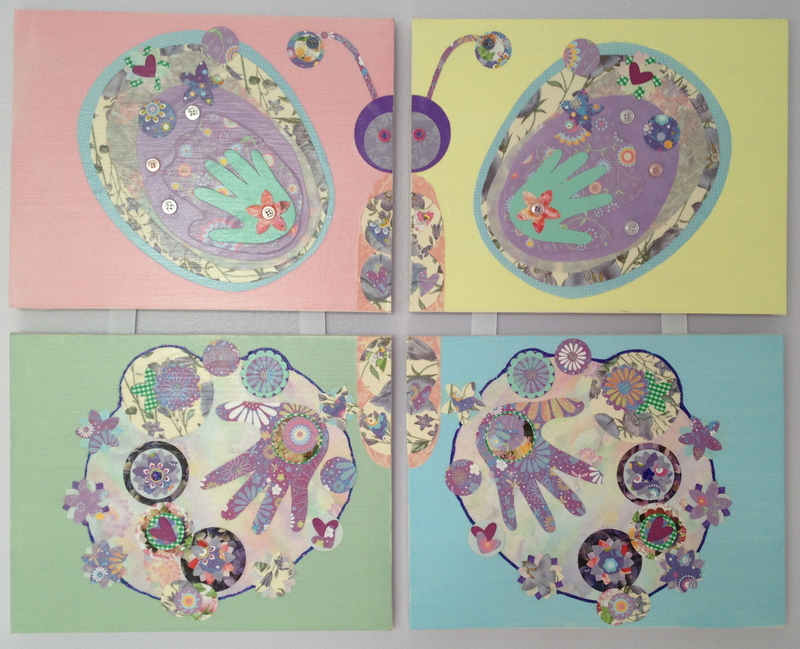 In this butterfly (above) I traced the kids’ hands and I also applied glitter-glue and buttons. For buttons just make sure you use a lot of Mod Podge to stick them on, as well as going over the top several times. For the starfish and fish, I made really simple cut outs and I used a bit of shimmery gold paint over part of the yellow paper to give it depth. For these I also included the kids’ names but for privacy have blurred them out online. 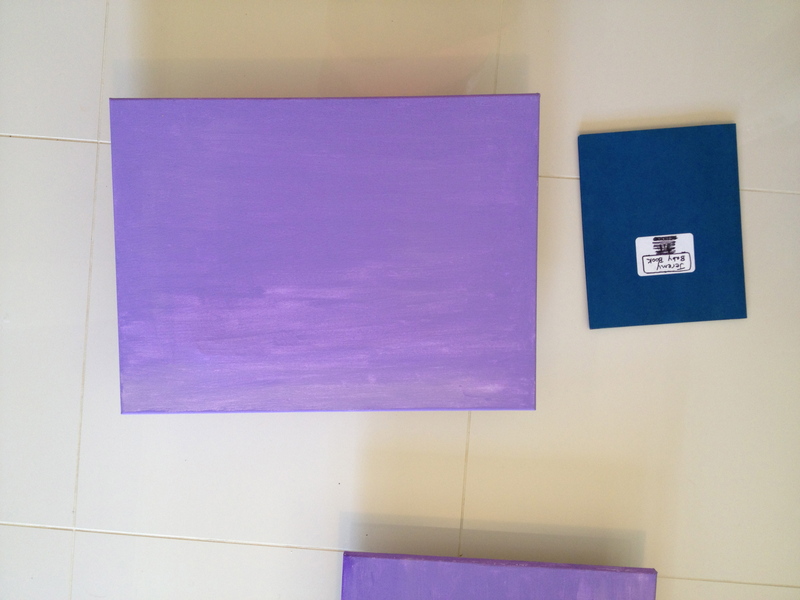 I hope I have inspired you to find your inner artist and make some DIY Kids’ Wall art! 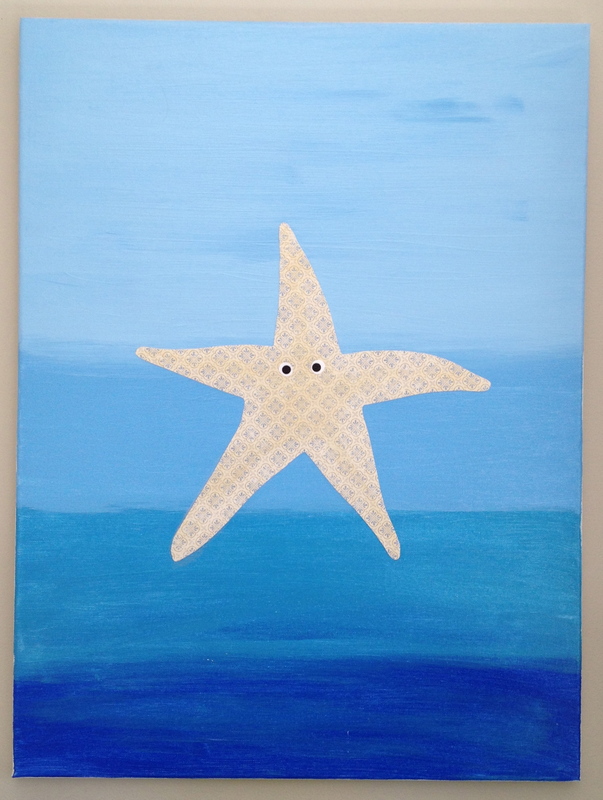 This entry was posted in Art, Bedroom, Color, Crafts, Decorating, Favorite Things, Kids, Kids Rooms, paint and tagged art, canvas, color, kids, Mod Podge, paint, paper, pottery barn, Wall art by organizedohana. Bookmark the permalink.